Thank the blogger who nominated you in the blog post and link back to their blog. Answer the 11 questions the blogger asked you. Nominate 11 new blogs to receive the award and write them 11 new questions. List the rules and display the Sunshine Blogger Award logo in your post and/or on your blog. What (or who) inspired you to start blogging? I followed several book blogs to enter giveaways and learn about new releases, and when I learned about requesting books for review through Netgalley, I started my own blog that day! How has blogging changed your life overall? What has been your favorite read of 2019 so far? What is one of your favorite songs? If you could take a vacation anywhere, what destination would you choose? Europe! My dream is coming true this summer with my first trip there! When you aren’t reading or blogging, what are you most likely to be doing? Besides the never-ending tasks of laundry and dishes... I like going to the beach and taking classes at my gym. What would you say is the easiest part about being a writer and what is the hardest part? For me, the easiest part is saying how I really feel about a book. The hardest part is making it sound good! I have a tendency to use the same words and phrases between reviews to describe elements of a book, so I have to make an effort to come up with fresh ways of expressing my thoughts. Who inspired your love of reading? My mom and dad read to my sisters and me as young kids, and growing up they always made sure we had books to read through trips to the library. What is the best piece of advice you’ve ever received? What was your favorite book as a child? Of all the blog posts you’ve written, which is your favorite? Please post the link. I don't have a blog post that comes to mind since I stick to mainly reviews and tours... and I have a horrible memory! I do admire the creative posts that other bloggers come up with. It's always fun to pick my favorites of the year and post about those, but I pick so many it turns into a series of posts! Where is your favorite place you’ve ever been? What /where is the setting of any of your current reads? Do you have a favorite celebrity or author? What do you think makes a great friend? What do you do to feel better when you’re feeling down? What is your favorite kind of bookish merch? Name a book that you wish had a sequel. Which of the 7 dwarfs are you most similar to? What state haven’t you lived in but would like to? Who would play you, in a film/series about your life? If you were to write a book, what would it be about? 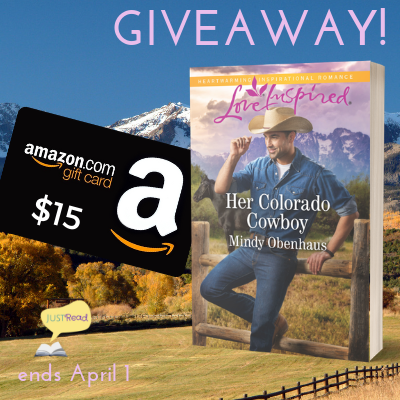 Welcome to the Blog Tour and Giveaway for Her Colorado Cowboy by Mindy Obenhaus, hosted by JustRead Publicity Tours! Socialite Lily Davis agrees to take her children riding…despite her fear of horses. But now widowed cowboy Noah Stephens is determined to help her get comfortable in the saddle. And, at her children’s insistence, Lily finds herself promoting his rodeo school. As Noah and Lily work together, will Noah continue to shield his heart…or can they discover a love that conquers both their fears? Can you tell us a little about yourself? What do you do besides writing? I love to cook, watch countless hours of The Food Network and Hallmark Channel, shop and play with my grandbabies. Do you have images you can share that come close to how you picture your characters? Do you like to find visual inspiration for your characters before or during your writing process? Yes, I’m a very visual person, so I need that visual inspiration as I’m writing. Most times I have a “prototype” in mind, but sometimes it’s not until I’m writing and get a better feel for the character that I have a particular person in mind. What are some songs that you listened to or inspired you while writing your book? While I love music, I prefer to write in silence. Probably because I’m too easily distracted. I do find inspiration in songs, though. Some books actually have a theme song, unfortunately that wasn’t the case for Her Colorado Cowboy. What message would you like readers to ultimately take away from the book? I want them to know that we serve a God of second chances. Even when we say NEVER, God has a plan. It may not be what we envisioned, but it‘s always better than anything we could have come up with on our own. What can we look forward to coming from you in the future? Book four in my Rocky Mountain Heroes series, Reunited in the Rockies, is scheduled to release in September, with the fifth, and final, book on shelves early next year. It took Mindy Obenhaus forty years to figure out what she wanted to do when she grew up, but once God called her to write, she never looked back. A three-time Carol Award finalist, Mindy is passionate about touching readers with Biblical truths in an entertaining, and sometimes adventurous, manner. When she’s not writing, she enjoys cooking and spending time with her grandchildren at her Texas ranch. Enter via the Rafflecopter giveaway below. Giveaway will begin at midnight March 25, 2019 and last through 11:59 pm April 1, 2019. US only. Void where prohibited by law. Winners will be notified within 2 weeks of close of the giveaway and given 48 hours to respond or a new winner will be chosen. Follow along at JustRead Tours for a full list of stops! 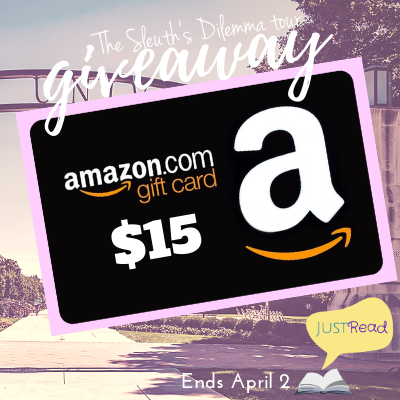 Welcome to the Blog Blitz and Giveaway for The Sleuth's Dilemma by Kimberly Rose Johnson, hosted by JustRead Publicity Tours! Anna loves her job as a high school English teacher until everything goes sideways. The one bright spot in her life is Titus Gains, the school counselor, who is there for her at every turn. Titus’ boss complicates his ordered world when she tasks him with running a meeting that changes everything. How had he not noticed Anna earlier? Someone is out to destroy her, and he can’t let that happen. As the head of the English department, part of Luke Harms’ job is to make sure everything runs smoothly. Things went haywire when Anna was put in charge of the big writing contest. Entries are missing, Anna appears to be in danger, and her job is on the line. Luke is investigating and wants to make things right for this woman he’s starting to care about. 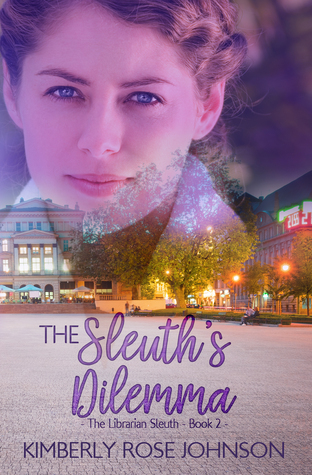 Can a trio of school officials along with Nancy Daley, the town sleuth, stop the saboteur before it’s too late? And will Anna choose the right man, or lose them both? All sorts of things. J I love walking in the evenings with my husband. I read, dream of traveling as well as take the occasional trip, and watch Hallmark movies among other shows like NCIS. I would direct you to the cover of my books for images of my characters. I don’t actually pick a model and write my characters based on that model. I like the freedom creating my characters without being tied down to a specific model. That being said, I don’t have a clear image of my characters in my mind. They are fuzzy. I’ve heard that our brains, or maybe it’s our subconscious, can’t create faces it has never seen, which lines up with hazy mental images. I don’t listen to music when writing, although in the middle of the summer while writing a Christmas book, I’ve been known to play Christmas music to get into the spirit of Christmas. Although I am a musician and performed vocally and taught piano for many years, I rarely listen to music anymore. I still love it, but I spend my workday writing and it interferes with my thoughts. I have to be able to hear myself think. I put the radio on in the car, but only if I’m alone, which isn’t often. I have a very hard time understating what people are saying when there is any kind of noise going on, so music makes conversation nearly impossible. The third book in The Librarian Sleuth Series releases in November. I also have a Christmas novella releasing around that same time. Thanks for having me on your blog! Award winning author Kimberly Rose Johnson married her college sweetheart and lives in the Pacific Northwest. From a young child Kimberly has been an avid reader. That love of reading fostered a creative mind and led to her passion for writing. She especially loves romance and writes contemporary romance and romantic mystery that warms the heart and feeds the soul. Kimberly holds a degree in Behavioral Science from Northwest University in Kirkland, Washington, and is a member of American Christian Fiction Writers. Enter via the Rafflecopter giveaway below. Giveaway will begin at midnight March 26, 2019 and last through 11:59 pm April 2, 2019. Open internationally as long as winner can accept gift card from US Amazon. Void where prohibited by law. Winners will be notified within 2 weeks of close of the giveaway and given 48 hours to respond or a new winner will be chosen. 5 stars - It was amazing! Share book reviews and ratings with Heidi, and even join a book club on Goodreads. Follow Heidi's board books & reading on Pinterest. Travel theme. Theme images by duncan1890. Powered by Blogger.